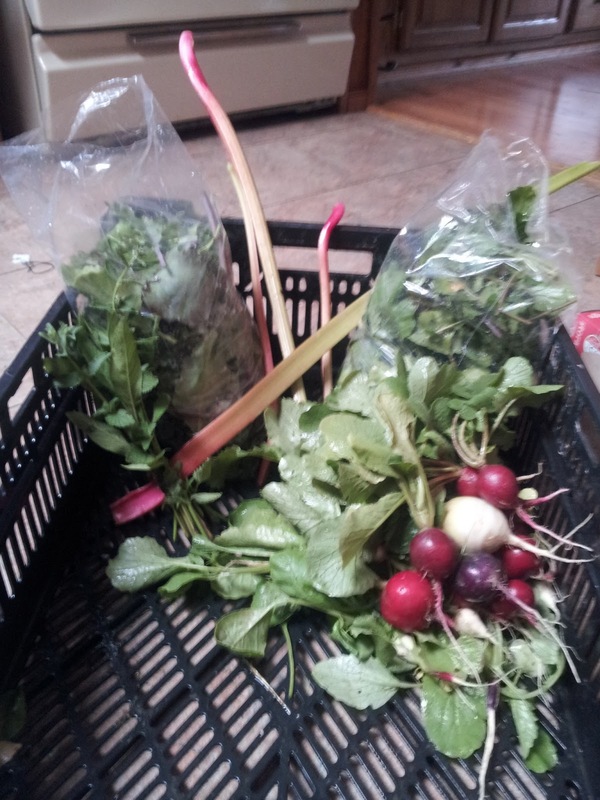 The first CSA shares of the 2013 season have started! If your a CSA member, make sure you check out our home page for any updates. Until the Farmer's Markets start, June 18th for Ada, and July 10th for Ionia, we will be delivering to your door. If you selected on farm pick up we'll see you at the farm Thursday between 12pm-6pm. This is only a half share! First we have a bag of Kale and Kohlrabi greens. Perfect for sautéing or braising. Or you can make chips out of the Kale and Kohlrabi leaves! Or, you can give our Kale and Tomato Frittata recipe a try. Next we have a bag of mixed salad greens--arugula, spinach and lettuce greens. Arugula is in the mustard family, give it a wiff and a taste and you can tell! It adds some welcome spice and nutty flavor to any salad. We also have a bunch of Radishes this week, which can be eaten raw on salads, or sauteed, grilled, or roasted as a side! Farmer Don likes to eat sliced radishes on buttered sourdough toast, give it a try for a healthy snack and tell us what you think! We had to thin the next planting of radishes and have included the extra greens in the share this week. We use them for Radish Leaf and Potato Soup which turns out green and delicious. We substituted chicken broth for the water to give it more flavor. This soup is definitely going to become a staple for us. You can also sautée the greens with butter, garlic, salt and pepper for an easy side. The green and red stalks are Rhubarb stalks, chop them up and make some Strawberry Rhubarb Turnover Pie! Looking for fresh, local and naturally grown strawberries? Sadly we don't have any ourselves, but we found some delicious ones at a farm stand off M-57, west of Carson City. We've also included the first of our herbs--Sage and Mint. Sage goes well with many meat dishes--lamb, beef, poultry. We like to use it for roast chicken instead of parsley and in our pizza crusts. Check out this Spice chart to see what spices go well with what dishes.